Mauritania, officially known as the Islamic Republic of Mauritania is a country in Northwest Africa. Since gaining independence from France, Mauritania has had a turbulent history notably through numerous coups against the government. Despite a somewhat challenging political and security landscape, Mauritania is deemed by the West as a valuable partner in fighting terrorism in the Sahel region. Not only is Mauritania strategically located, it is hosting the headquarters of the Secretariat of the G-5 Sahel countries. Moreover, Mauritania is part of a number of taskforces to combat terrorism such as Middle East and North Africa Financial Action Task Force. Additionally, Mauritania maintains observer status in the Intergovernmental Action Group against Money Laundering in West Africa. As such, updated and new regulations require banks to report suspicious transactions to its financial intelligence unit. Mauritania also participates in a number of U.S.-sponsored training courses on counter-terrorism techniques. From trafficking to terrorism, Mauritania is confronted with many security challenges. The main challenge is the growing threat from Al-Qaeda in the Megreb. The terrorist group takes advantage of the large territories and porous borders of Mauritania and has a numerous supply networks into northern Mali. These security challenges have wide reach and in an effort to counter regional instability, NATO’s numerous frameworks of cooperation attempt to offer practical solutions. Mauritania and NATO have engaged in steady high-level talks, meetings, and initiatives to address these challenges and work on their interoperability and cohesion as allies. 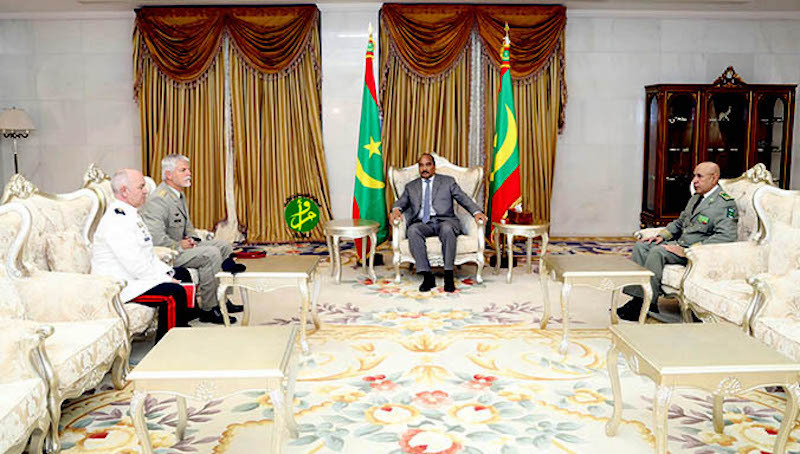 In May 2018, General Petr Pavel, Chairman of the NATO Military Committee visited Nouakchott, Mauritania and met with the President Mohamed Ould Abdel Aziz to discuss NATO and Mauritania’s ongoing cooperation through the framework of the Mediterranean Dialogue in an effort to confront security issues such as counter-terrorism. During the meeting, the NATO’s chairman said, “in this ever changing security environment, now more than ever, it is important that we work together to increase global security and stability”. NATO has a number of cooperation mechanisms and activities in Mauritania executed under the framework of the Mediterranean Dialogue. The Mediterranean Dialogue (MD) forum was launched in 1994 with the aim of enhancing regional security. The MD consists of the NATO alliance and seven non-NATO countries: Algeria, Egypt, Israel, Jordan, Mauritania, Morocco and Tunisia. On 2-3 October, NATO Mediterranean Dialogue-Policy Advisory Group (MD PAG) took place in Nouakchott, Mauritania which mostly focused on NATO’s cooperation with Mediterranean Dialogue partners and ways to enhance cooperation. The areas of cooperation include “security institutions building, defence transformation, modernisation and capacity development, civil-military relations, and defence-related aspects of the transformation and reform of the security sector”. Cooperation is structured through bilateral ‘Individual Partnership Cooperation Programs’ between NATO and each MD countries. These tailored programs that aim to boost political and practical cooperation are one of the main instruments of cooperation between NATO and the MD countries . Currently, Mauritania is one of the MD countries that has an Individual Cooperation Programme with NATO. As such, Mauritania has benefitted from a NATO Trust Fund on stockpile destruction and ammunition storage. This initiative ensures that stockpiles do not end up in the hands of terrorist groups. Additionally, Mauritania is being assisted by Defence Education Enhancement Program to build capacity through defence education reform. This project emphasizes the educational side of counter-terrorism. In addition to the MD, since 2007, Mauritania has been actively participating within the framework of the NATO Science for Peace and Security (SPS) Programme. NATO has been supporting Mauritania by implementing a crisis management centre. The national centre will provide operational watch and provide early warning against threats and risks. The system complies and analyzes information using modern technology and simulations. Currently, there are four operational coordination centres located in Nouakchott, Nouadhibou, Rosso and Nema. The centres track incidents and gathers information should one of the regions be affected by an emergency event. The crisis management centre is being financed through the SPS programme and through substantial donations from France and Canada. In March 2018, the SPS programme hosted a meeting to discover future projects in the area of civil emergency. During the meeting, experts from Mauritania, Romania and France discussed ways to develop the area of civil emergency by building new emergency units in remote areas in Mauritania. During the meeting it was added that, “A follow-on project could be agreed by Allies by November 2018”. Mauritania has been part of the MD framework since 1995 and as a result of steady political and practical initiatives, NATO efforts in through the MD and SPS programme have not only enhanced relations but have contributed to a number of sectors such civil emergency, environmental security, and counter-terrorism. As a result of these efforts, Mauritania engages in information sharing with NATO. This includes reports on the security situation in the Sahel or proliferation concerns related to Libya. Two-way dialogue and joint ownership in addressing emerging security challenges is the most effective way for NATO and Mauritania to continue to tackle the issues in the Sahel.